What will those crazy Amish think up next? Daniel on What will those crazy Amish think up next? So here you go kiddies: This week's caption contest. 1. E-mail me your entry (entries). 2. Write "CAPTION CONTEST" in the subject line. 3. Tell me where you live (all I'll put out for people to see is what city/town/area you call home). 4. Get it to me by Monday at 5 p.m.
5. Stop back Monday evening through Wednesday morning at 10 a.m. to vote for your favorite finalist. The caption that gets the most votes this week is the winner. "The new head will start to grow hair once its attached to your --body." "The problem with you, Carl, is that you never think outside of the box." "Normally we would hand you your head on a silver platter, but due to cost cutting, we're using boxes this year." "What we need here is some one who unlike Jack can think outside the box." "NOT TO WORRY SIR. THIS IS SIMPLY A CASE OF YOU THINKING OUTSIDE THE BOX." "You're fired. 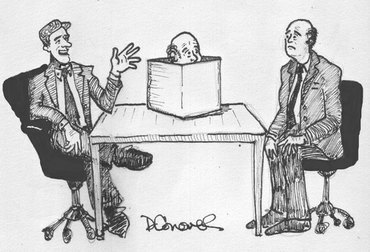 I told you to think out of the box not in the box." "I think that two heads are better than one for this project." "See Mr. Billingsly, I told you I had a plan to get a head." "I'm sorry Jim, we decided to use your twin brother Jack for our new toy." "We've had to reduce our staff by 2/3's. This is the best we could do." "WE KNOW THIS NEW CUBICLE DESIGN IS A LITTLE SMALL BUT YOU'LL ADJUST". 1. "Welcome to the company. Let me introduce to your cubical mate." 2. "The good news: you're hired. The bad news: you'll be sharing a cubical with Quinby, here ." 3. "I sure hope you can think outside the box!" 4. "Charley, here, will give you a 'heads up' on what to expect." "Sorry Ted, but we really need you to think outside the box." "It's just Al, repackaged as a conservative conservationist"
"It's just another presidential candidate, packaged to win his party's nomination"
Andy Savage to his client... "Al, the good news is your investors have agreed to a settlement." "Ted, this is not the way to get ahead in the box company." "Just think of it as you, but with a different brain." "We understand that you want to 'get ahead', but unfortunately in the present business climate this is the best we could do". 1. "You'll be replacing Weatherby here who had a tough time thinking outside the box." 2. "We believe you'll be head and shoulders above your predecessor Weatherby." 3. "We're phasing out the head supervisor position." More entries, and remember: Early deadlines today so y'all can vote on the finalists! "No, no. Your promotion is denied. You have to do BOTH in this business: Think ahead and think outside of the box." "Meet Mr. Smith, the individual you’ll be replacing. Unfortunately, he never learned to think ‘outside the box’!" "Since you were the company whistleblower, how is this for some new merchandise: 'Pop goes the weasel.'" "You won’t believe it! It’s our #1 blow up doll on the market today!!" "Your replacement was found by a headhunter."